One of the most colorful voices in Southern Soul (a term which he re-invented in his own image and likeness) has left us, passing peacefully in his sleep at his 'ranch' outside of Jackson, Mississippi. Born in Jackson, Jones had moved to New Orleans in the early fifties and eventually carved out a niche for himself as an independent 'record man' and producer, one who seemed to thrive after most of the other small companies had gone out of business. 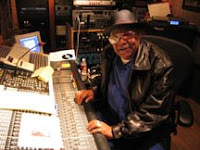 His first label, Black Patch, was home to Rockie Charles' debut single, the very cool Riccasha in 1968. A succession of labels would follow (like Shagg, Superdome and Jenmark) on which he cut local artists like The Barons and Guitar Ray. As he told Jeff Hannusch in The Soul of New Orleans; "As I got more artists, I didn't want to go to the radio station with seven records on the same label... the dee-jays would say 'I can't play all of those records...' So I started new labels and I switched colors on the record labels to make them look different." 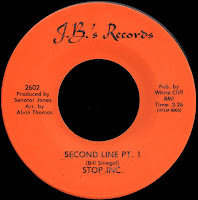 Another of them was called J.B.'s, on which his re-recorded version of Mardi Gras standard Second Line (the original White Cliffs master by Bill Sinigal having been lost in the Cosimo Matassa bankruptcy) would appear in 1974, and get played to death every Carnival season since. 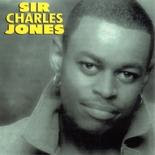 J.B.'s was also home to great records by James Rivers and Charles Brimmer. We've already talked about how it was Brimmer's version of God Bless Our Love that charted in 1975, after Chelsea picked up the J.B.'s original for national distribution. The most enduring of all of the Senator's imprints, however, was Hep' Me, which he operated right up until the day he died. This greasy chunk of funk that we have here today was the very first release on the label in 1973. 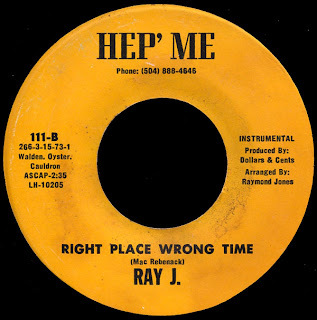 Recorded at Deep South Studios in Baton Rouge, Ray J. was the stage name of one Raymond Jones, who was the keyboard man in Brimmer's band, in addition to holding down a day job as the music teacher at Xavier Prep back in the Crescent City. He would work with the Senator for years as an arranger, alongside folks like Sam Henry Jr. and Wardell Quezergue. Once Allen Toussaint and Marshall Sehorn opened their Sea-Saint Studio in New Orleans, Jones became one of their best customers, working out some kind of percentage deal with Sehorn in exchange for studio time. He would produce some of his best records at the studio on folks like Barbara George, Tommy Ridgley, Bobby Powell, Walter 'Wolfman' Washington and, of course, Johnny Adams. Johnny had signed with Jones after his run with Shelby Singleton had taken its course, and recorded a slew of singles that kept him out there in the public eye. 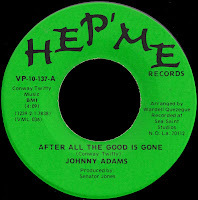 His Hep' Me version of Conway Twitty's After All The Good Is Gone was leased to Ariola Records, who would cut an album on him as well. When Adams left Hep' Me to sign with Rounder in 1983, the Senator read the handwriting on the wall. His radio connections had dried up, as stations got bought up by the corporations, and the role of independent label owner just wasn't happening any more... at least not in New Orleans. By the end of the decade, Senator Jones had returned home to Jackson, working briefly with local legends Johnny Vincent and George Jackson while getting the lay of the land. 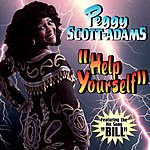 His partnership with Warren Hildebrand in Mardi Gras Records in the nineties helped define what was happening in southern 'grown folks' music as records by folks like Sweet Miss Coffy, Peggy Scott-Adams, and The Love Doctor became hits in the down home radio market in a genre that would become known as 'Southern Soul'. Quite the character, he was also the host of his own late night radio show on WMPR in Jackson. Known as 'Uncle Bobo', he regaled listeners with stories of his life out on the ranch, chasing around his farm animals in between cutting the latest hits at his home studio. Howdy--- I've been digging the blog here--- Classic stuff! It's great to see a blog dedicated to the immortal "B" side. Can someone please tell me who wrote te song "right place wrong time" It seems Dr. John takes credit for it? the song was indeed written by Dr. John aka Mac Rebennack - although his name is mis-spelled (with only one 'N') both on this 45 and his 1973 ATCO release... thanks!